The purpose of this book is to teach the main concepts of Bayesian data analysis. We will learn how to effectively use PyMC3, a Python library for probabilistic programming, to perform Bayesian parameter estimation, to check models and validate them. This book begins presenting the key concepts of the Bayesian framework and the main advantages of this approach from a practical point of view. Moving on, we will explore the power and flexibility of generalized linear models and how to adapt them to a wide array of problems, including regression and classification. We will also look into mixture models and clustering data, and we will finish with advanced topics like non-parametrics models and Gaussian processes. 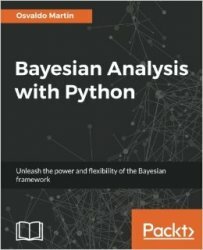 With the help of Python and PyMC3 you will learn to implement, check and expand Bayesian models to solve data analysis problems.